I was wondering if it was true variable refresh rate or a fixed variable refresh only when displaying 24hz video, etc. But Apple’s Metal 2 session during WWDC17 cleared that up, and confirmed that TRUE variable refresh rate is indeed part of ProMotion! 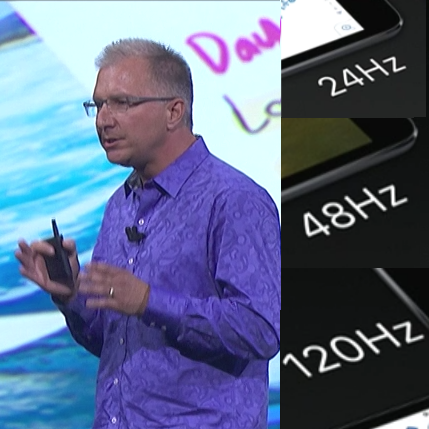 They synchronize the entire user interface to the display, so whenever the GPU output drops below 120fps for a moment to say 103fps, the iPad Pro display synchronizes it’s refresh rate to the drop. This eliminates all stuttering/jank from dropped frames throughout the interface, even when the GPU can’t keep up at 120fps you won’t actually be able to visually see the drop! True variable reresh rate support on mobiles is fantastic! Currently, the pre-games I tried don’t seem to support true VRR yet, but I would imagine that this is a very simple app update (and if needed, minor OS update), in order to make ProMotion VRR work with OpenGL on the iPad. There seems to be no technical limitation preventing such. I suspect that this is because VRR requires VSYNC OFF (to decouple the game from the “fixed timer” of a traditional refresh rate). And most Apple games don’t use VSYNC OFF operation (possibly as an Apple mandatory requirement to ban tearlines from app store?). Probably a very simple change! As of iOS 10.3.3 Apple hasn’t enabled VRR outside of video playback, as they’ve integrated support into the Metal 2 API only included with iOS 11. The current 10.3.3 release supports 120Hz refresh, but VRR is only enabled when displaying 24Hz content using the AVPlayer for video playback and also when all motion ceases on the display, in which case it drops to 1Hz until motion is introduced at which point it rockets back up to 120Hz. In iOS 11 they have true VRR enabled for anything that uses the Metal 2 API, which includes the entire user interface and all first party apps (anything built in CoreAnimation and CoreGraphics frameworks). They didn’t mention if OpenGL apps will be able to utilize the VRR support, they only mentioned it in relation to utilizing Metal 2 (which was the focus of this WWDC session to be fair) but as you said, it may only require an app update to enable it even for OpenGL based applications!